Fishing Lake Mille Lac - Fishing Minnesota - Fishing for walleye, pike, muskie, crappie and jumbo perch. Lake Mille Lacs is Minnesota's second-largest inland lake at 132,516 acres (536 km2). The maximum depth of Lake Mille Lacs is 42 feet, although the average depth of the main lake is between 20 to 38 feet. The northern half of Lake Mille Lacs consists mostly of weedy mud flats, while gravel and rock bars cover the southern half of the lake. Shallow shoals and reefs can be found throughout the lake and are heavily targeted by anglers. When fish are holding deep, anglers concentrate their efforts on deep gravel / rock piles as well as on the dozens of deep mud flats in the northern half of the lake. Shore anglers generally fish shoreline drop-offs and areas with varied bottom types. The weed line in Lake Mille Lacs is generally located between nine to twelve feet. Due to the overall shallow nature of Lake Mille Lacs no thermocline forms, hence the fish can occupy all areas and lake depths throughout the season. The lake has many species of fish including walleye, northern pike, muskie, jumbo perch, smallmouth bass, largemouth bass, black crappie, burbot, and tullibee. It is one of Minnesota 's most popular fishing lakes, especially in winter, when ice fishing shanty huts can number in the thousands. 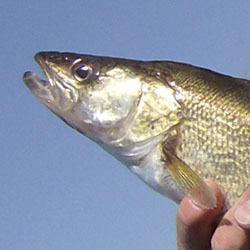 The most sought after fish in Lake Mille Lacs is the walleye. The lake has a very healthy population of walleye, with prime spawning grounds and billions of walleye eggs and fry produced there every year. Trolling worm harnesses along the deep water mud flats or jigging twister tails tipped with worms or a minnow on the tops of shoals can be very productive. In winter, shanty huts will be concentrated on the more productive walleye hotspots on Lake Mille Lacs, and are easy to locate during the ice fishing season. Jumbo Perch are also heavily targeted in winter on Lake Mille Lacs. 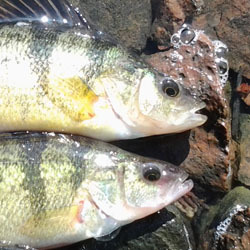 Perch can be found scattered throughout the lake, although they will generally relate to weeds. Finding green weeds in winter are the key. Jigging small spoons tipped with a minnow just off the bottom can be deadly for Lake Mille Lacs jumbo perch. Pike are also abundant in Lake Mille Lacs, in winter dead strike rigs, baited with a large dead shiner can be productive. Most anglers concentrate in depths of 10 feet or less. In spring, pike will move into shallow weed flats to spawn. Casting slow swimming spinner baits in white or yellow can produce some lunker pike. Catching a bonus muskie is not unexpected when targeting Lake Mille Lacs pike, since both species of esox inhabit the lake. Each detailed map provides depth, contours, structure, boat ramps, and updated fishing information. Lake Mille Lac fishing maps also include lake info such as gamefish abundance, forage base, water clarity, weedline depth, bottom composition, complete latitude/longitude grid lines and dozens of GPS waypoints & coordinates.